Kande Pohe /Aval Upma is a popular Maharashtrian snack recipe where in 'kande' refers to onion and 'poha' refers to beaten rice /aval.My kids love to call this aval upma,perfect enough to break the monotony of regular breakfast menu and also serves best as an evening snack for kids.I usually serve it with chutneys,makes a perfect combo.A popular one to many of us but still there are many who are unaware of the recipe,so sharing the authentic one with all.Enjoy making the healthy snack for your dear ones !!! -Clean ,wash and soak the poha for a minute, drain the water using a colander.Keep aside covered to retain the moisture. -Heat the oil in a wok,splutter mustard seeds. -Add the peanuts and fry them till lightly browned in the same oil. -Add the curry leaves followed by chopped onion. -Saute until translucent followed by green chillies. -Add the drained poha /beaten rice to it.Add in salt.Combine well. -Cover and cook for 5-6 mins on medium flame. -Remove lid and garnish with chopped coriander leaves & shredded coconut.Keep covered until you serve. -Serve with coconut chutney/mint chutney or a wedge of lemon or JLT !! * You can add cumin seeds too to flavor it up along with mustard seeds. * Adding green chillies is totally upto you depending on the spice required. Healthy and delicious snack.. Also perfect for light breakfast.. Love this..
Kande poha looks perfect and delicious Julie. 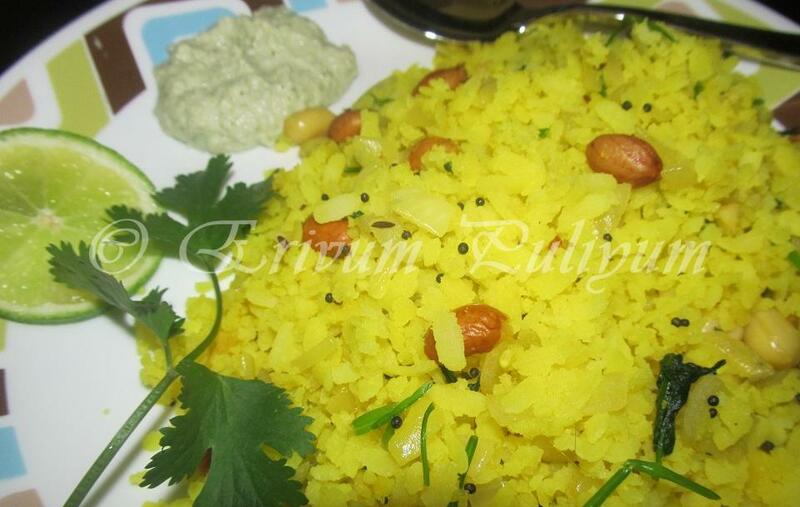 Mouthwatering poha dear. Love it anyday. delicious and a good breakfast. healthy and tasty upma. looks nice. love the colour.. perfectly done. its so good and filling to have for breakfast. i make lemon poha..this looks yumm..
my fav breakfast...perfectly done Julie. Hey ..finally visiting u after a long time...when I get time I might go through what i missed..Poha is my fav ,but havent made this since ages..
My all time fav.. love it!! very simple yet delicious and filling. looks perfect. This reminds me so much of my dad..his favorite.. Whenever I feel hungry I prepare it immediately and enjoy. 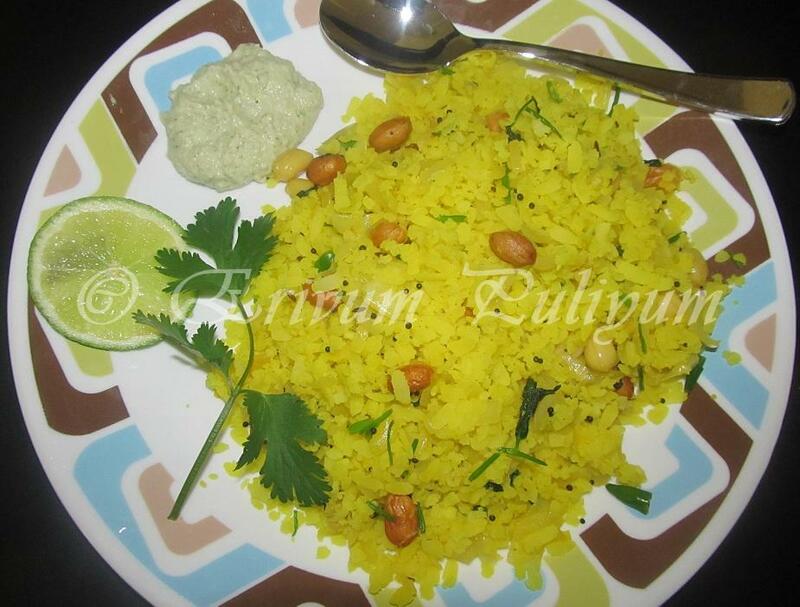 delicious pictures Julie..
Aval poha looks delicious. Looks fluffy and soft. Any day favorite. Love them!! My ex-roomy used to add boiled potatos and chopped capsicum to poha. It tasted good too! !